Around 1820, three sons of North Carolina’s surveyor general came to Mississippi to inspect the acreage opened up by Indian treaties. One of the three, John Johnstone, eventually bought twenty-five hundred acres near the Mannsdale Community. He returned to North Carolina to marry Margaret Thompson; she and their two daughters, Helen and Frances, stayed at the old homeplace while John traveled the long trails back and forth to Mississippi for fifteen years. He gradually moved his equipment, slaves and, in 1840, his family to Madison County. A large log cabin was their first home; it was known as Annandale in honor of the Johnstone’s ancestral Scottish lands. John and Margaret were not to be outdone by their daughter and son-in-law. 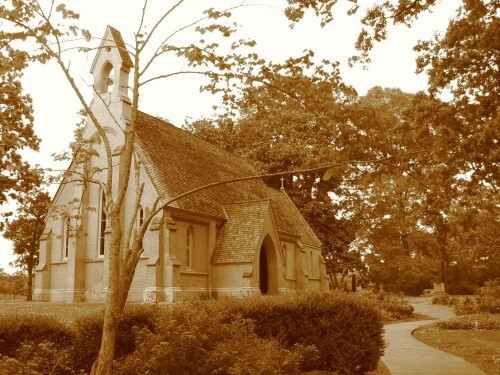 They spent considerable time planning the construction of a chapel and home at Annandale, but John would not live to see the completion of either. He died suddenly in 1848, leaving a very determined widow to carry their plans forward. Margaret took over operation of the plantation and had the Episcopal Chapel of the Cross built in memory of her husband. It was consecrated in 1852. Turning their attention toward erection of a suitable house, Margaret and her younger daughter, Helen, traveled the nation studying the latest architectural styles. Rejecting the prevailing mania for Greek Revival, Margaret selected a plan for “Villa No. 4” in Minard Lafever’s Architectural Instructor, a popular pattern book of the day. Master builder Jacob Larmour was engaged for the job, millwork was ordered from Hinkle, Guild of Cincinnati, and the forty-room, three-story mansion known as Annandale began to rise above the rolling fields of Madison County. Annandale’s construction took a full three years, and Margaret and Helen moved in during 1859. The exterior of Annandale was exuberantly Italianate, unlike anything else ever built in Mississippi. Its three-story central block featured rounded-arch, rectangular and square windows on successive levels. Multiple arches ran the length of the galleries, and heavy modillion brackets underlay the eaves. Life for those at Ingleside and Annandale was typical of country gentry, but the tranquility as soon shattered by tragedy, giving rise to the story of “the bride of Annandale.” Young Helen met Henry Grey Vick, great-nephew of Vicksburg’s founder, when his carriage broke down near Ingleside. They were soon engaged, with a wedding date set for Helen’s twenty-first birthday, May 21, 1859. Annandale’s finishing touches were being hurried into place and frenzied preparations were underway for Madison County’s premier social event. Henry left for a quick business trip to New Orleans, promising Helen that he would always avoid the prevailing tradition of dueling over the slightest insult. Despite his best intentions, he became involved in a dispute over land with an old acquaintance, James Stith. Tempers flared, words were standards, reluctantly headed for Alabama, first making out a will in which he left his possessions to Helen. As he and Stith faced off on the dueling field, Vick fired his gun into the air and was killed instantly when Stith’s bullet struck him in the head. Back in Madison County, the unsuspecting Mrs. Johnstone and Helen were arranging parlor decorations at Ingleside when a telegram arrived by messenger: “Henry Vick killed today May 17 in a duel at Mobile, Alabama. Will bring body to Vicksburg on earliest steamer.” The family, plunged from the emotional high of wedding preparations into an inconsolable mourning, was forced to wait for Henry’s body to be brought from the landing at Vicksburg. The funeral cortege arrived near midnight on the eve of what would have been the wedding day. The torchlight procession wound through old Mannsdale to the Chapel of the Cross, and Henry was buried there. The gloom at Annandale was intensified by escalating threats of war, which burst into reality in 1861. True to her nature, Margaret Johnstone stood fast on her plantation, organizing the Livingston Ladies Military Aid Association of Annandale. Helen had fine gray uniforms fitted for a local troop who would go through the war as the Helen Johnstone Guards. Annandale and Ingleside were never seriously threatened by the devastating events in the neighboring Hinds and Warren counties, but Reconstruction brought change to every corner. William Britton feared for the future of Ingleside in those uncertain times and sold the plantation, moving his family to Pass Christian. There he built another fine house facing the Gulf of Mexico. After his death in 1871, the family moved back to Madison County; finding Ingleside in disrepair and the new owners remiss in their payments, they immediately repossessed it and restored it to its proper state. A similar house was soon built on the foundations of the first Ingleside, but it never approached the magnificence of the original. Hard times and neglect led to foreclosure, and the second Ingleside slowly collapsed. The walls of the dining room provided enough lumber to build an enormous barn, which stood on the old plantation land for years. When the structure was finally torn down, it yielded the original hinges and doorknobs from Ingleside. -- from Lost Mansions of Mississippi by Mary Carol Miller. Click here to purchase a copy of this book.